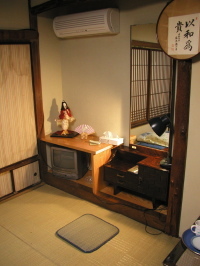 Tama Ryokan is a Japanese inn in Shinjuku, Tokyo, providing basic accommodation for travelers on a budget. It is about 3 minutes walk from the Yamanote line and literally seconds from the Tozai metro. We have WiFi throughout the hotel. All of these rooms except Ikkai are on the second floor, and there is no elevator; if you have trouble with stairs, we may have trouble accommodating you. By clicking here you can find a number of train routes for reaching our hotel from Narita airport or Haneda airport. Fast, comfortable, but a little pricey: take the Limousine Bus, whose ticket counter is the first you'll see when you emerge from customs at Narita, and transfer at Shinjuku station to the JR Yamanote line. We're two stops from Shinjuku station, in the direction of Ikebukuro. Take the JR Yamanote line to Takadanobaba station. Exit the main ticket gate (away from Shinjuku, toward Ikebukuro) and turn right. Leaving the station, you will see monolithic Big Box to your immediate right, an avenue (Waseda-doori) to your left, traffic lights in front of you. Go several blocks down Waseda-doori, and turn right at Starbucks. In just a few steps, you'll see a sign that says "Old Japanese Inn" at about eye-level. Our door is just to the right of that sign. Payment should be in cash, when you arrive. For larger amounts, we can wait a day or two to allow you to find the best way to arrange for exchange to yen. For larger parties during busier seasons, we might require a deposit a week or two in advance, via PayPal. If you arrive and find we are overbooked, we will arrange for other accommodations and will pay the difference in price. If for any reason you find staying at Tama Ryokan unsatisfactory, we are willing to negotiate a discount. However, this provision does not extend to cover dissatisfaction over any inadequacies that have been explained on our website. Inform yourself about what Tama Ryokan does and does not offer before booking a room with us, and inquire by e-mail in advance if you have any questions. If you must leave earlier than planned because of an emergency, we will refund the balance. When credit card charging is available, cancellation up to a week before arrival will be subject to a 10% cancellation fee. Same-day cancellation (or no-show) will be charged at 100%, or the cost of your first three nights, whichever is smaller. Until we can charge your credit card, however, we must rely on the honor system. Please don't reserve with us unless you intend to stay. We are a very small inn, and we don't require a deposit. Please don't make a reservation unless you are serious about staying with us. The rooms do not have attached toilets or bathing facilities. See below for details. We have two toilets. One is on the second floor. The other is shared with another family business on the first floor; please observe the hours posted on its door. Bath is ofuro style - shower and a hot tub. I.e., if you want to use the bathtub, you must soap up and shower off before getting into the tub. Heating the bathwater requires some preparation and understanding of the controls. Most guests just use the shower. There a few sentos (Japanese traditional public baths) within 10 minutes walk from us. Know the rules before you go. Note that their sauna carries an extra charge. This is a family residence first, a ryokan second. If you are at all unsure whether you are crossing some boundary into family-only time and/or territory, please ask first. Our check-in time is 3pm. If you arrive earlier, you can leave your luggage. We just can't promise rooms being ready to sleep in before 3pm. Our checkout time is noon. We have cats. If you are allergic, this might be a problem. We try to keep them out of the rooms. We do not cook meals for guests. There is a refrigerator for guest use on the second floor. We have a payphone. Use of the FAX and of the business phone for long-distance calls is at the discretion of the managers. We have tatami (rice-straw mat) rooms. Wheeled luggage should not be rolled across it. Leave your slippers outside the sliding doors, please. We do not have laundry facilities for guest use, though we make exceptions for emergencies; note that there is no dryer in any case. There is, however, a laundromat about 1 minute walk from our door. We look forward to hearing from you. If you have any questions, or wish to book a room, e-mail me: Michael Turner (turner@tamaryokan.com). For general inquiries about travel in Japan, Schauwecker's Guide to Japan is an indispensable web resource. For longer stays (months and even years) check out The Wind Site. The Takadanobaba neighborhood offers a splendid variety of cuisine: Indian, Thai, Italian, French, Cambodian, Nepali, Burmese, and others, including Japanese, of course, with some cheap lunch-special prices. See Tokyo Food Pages for more details than we can possibly supply.